Irenaeus (a disciple of a disciple of the apostle John) was convinced that 'it is necessary to obey the presbyters [pastors and elders] who are in the Church' (Against Heresies 4.26.2). He wasn't just making that up, by the way - it's a Scriptural principal (Heb. 13:17). And Irenaeus particularly points this out in connection with the right reading of the Scriptures, seeing Christ and His Gospel in the Scriptures. It is, after all, the task of the presbyters to feed the flock by proclaiming Christ biblically. But, if we're to obey, or submit, to the presbyters who are in the church, that means we need to know who the true presbyters are. That's a major issue today, just as it was in Irenaeus' day. You see, Irenaeus realised something that we often don't realise: just because someone claims to be a pastor, doesn't mean they really are a pastor. So Irenaeus gives us some helpful advice on how to distinguish true and false presbyters. Now, before I give you a few points from Irenaeus, I have to be an honest historian and point out that there are some difficulties with what Irenaeus has to say for us today. Irenaeus was living at a time when the church was one united whole, but we don't live in such a time. Irenaeus was living at a time when people knew people who knew the apostles. He himself was a disciple of Polycarp who had been ordained as an elder by the apostle John. 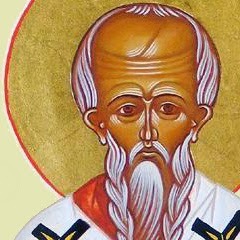 So when Irenaeus writes about presbyters having 'succession from the apostles', he's not thinking of tracing who ordained whom back through 2000 years of history (as in the modern concept of apostolic succession - which, interestingly enough is focused on bishops, not presbyters like Irenaeus), but rather he's talking about people who were actually ordained by the apostles, discipled by the apostles, trained by the apostles (or by their immediate successors - we're only talking about one generation's gap here). Now, I have some friends who would use this passage to tell me I need to become an Anglican or a Roman Catholic, by reading it in light of the modern idea of apostolic succession. This is why I've pointed out that we do have some difficulties in applying Irenaeus directly, but that doesn't mean we can't apply him at all. As I've said already, Irenaeus is referring to something slightly different when he writes about succession, so rather than read this passage as saying presbyters must be ordained by a bishop who can trace the lineage of his ordination all the way back to the apostles, we need to get back into the 2nd Century situation where the presbyters had all either been ordained by the apostles themselves or their immediate successors to see how to read this. And, we need to remember that here it's the succession of presbyters, not the succession of bishops that Irenaeus is writing about. So Irenaeus' focus here is on those who set themselves up as pastors, rather than being recognised and ordained by the church - something which is more and more common today. Christ has given pastors as a gift to the Church (Eph. 4:11), therefore pastors don't exist independently of the Church. It isn't a gift to an individual, who can then recognise himself as a pastor and set up his own 'ministry', 'fellowship', or 'church'. No. The gift is to the church, and therefore the church must recognise the call. Those who ignore the churchly aspect of calling to the ministry and go ahead and set themselves up as pastors unilaterally are dangerously ignoring God's revealed way of working; in other words, it's disobedience to His Word, and therefore sin. Irenaeus shows us that the sin can be one of three types, but all are equally dangerous to the flock of God: either it can be the sin of 1) heresy (he has to set up his own group and proclaim himself a pastor, because his false teachings would never be accepted in the true church), 2) schism (which is the sin of dividing the Body of Christ - a sin which we tend to take very lightly indeed in Pentecostal and Evangelical circles today), or 3) hypocrisy (he's in it for all the wrong reasons). Okay, so we already ruled out people setting themselves up as pastors, but what about those who seem to be more respectable? Are they automatically okay? Here Irenaeus warns us that even among those who have a respectable position, yet they aren't really serving as presbyters. This wasn't something particularly new. The apostle John had already had to deal with Diotrephes 'who love[d] to have the preeminence' (3 John 1:9). So Irenaeus is getting at two things here: these "presbyters" place their own desires above God and place themselves above others. In other words, they care more about themselves, their own comfort, and their position, than they do about sacrificially caring for Christ's flock. So, although they may have the title of pastor or elder, they don't have the heart of a pastor or elder. And once again, this is something quite relevant today. Men who set themselves up as the untouchable "man of God", who lord it over the people of God, who "minister" for large sums to feed their own material lusts, or who try to turn evil into "good" by claiming that the Holy Spirit told them it was okay, are not true pastors, despite the titles and positions they might hold. But this doesn't only apply to the extremes of the tele-evangelists, but also in ordinary churches, when men start to think that the flock is there for their benefit, rather than seeing that they are there to serve and feed the flock. Okay, so Irenaeus has given us two ways to recognise false presbyters, but what about the true ones? The true presbyters are not like the false ones. Unlike the false ones, they are both examples in their conduct and they are called, ordained and serve within the Church. But their conduct and their collegiality all flows from the primary way in which we recognise them: they hold fast to the doctrine of the apostles. Really this shouldn't be that much of a shock - after all, if the whole church is to 'continue steadfastly in the apostles' doctrine', then it's certainly true of the elders. In fact, the one qualification that sets elders apart from deacons (or even from general descriptions of growing Christian maturity) is that elders are to be 'apt to teach' (1 Tim. 3:2), and you can't be 'apt to teach' within the Church without a firm grasp of the apostles' doctrine. Irenaeus goes on to describe this teaching ministry: the presbyters 'preserve this faith of ours' and 'they expound the Scriptures to us without danger'; in other words, they defend the faith, pass it on, and proclaim it in preaching.That's what true presbyters will be found doing - not starting innovative, new movements, but passing on 'the faith once delivered' and proclaiming Christ biblically.